Fat Quarter Shop's Jolly Jabber: Mini Quilts Discussion: Video with Kimberly & Sherri McConnell! Mini Quilts Discussion: Video with Kimberly & Sherri McConnell! We love quilts of any and all sizes, but there's something particularly fun about a Mini Quilt. Not only are minis super adorable and perfect for wall décor or a table topper, but they're a great way to try out a new technique without committing to it for a big, time-consuming quilt. Sew fun! They also make great gifts and can be made into beautiful throw pillows! Today we're pleased to share a final video featuring special guest Sherri McConnell - fabric designer and pattern designer. 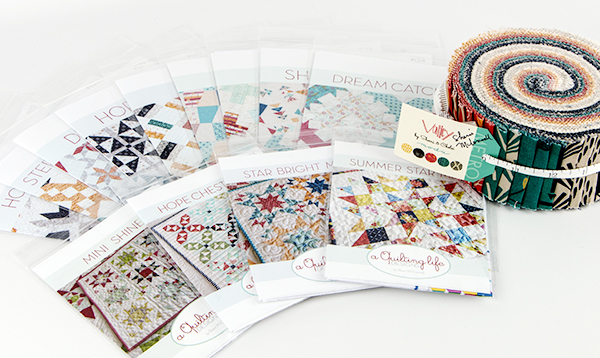 Sherri shares her mini quilts with us, made from patterns sold at the Fat Quarter Shop, and they're gorgeous! We hope you'll pick a favorite pattern and share it in a comment on this post. We're dying to know which pattern is your #1 fav! Happy MINI Quilting!